The Dutch supermarket Plus signed the rights of the Eredivisie for the season 2011/2012 after that for three years they belonged to AH, who released three sticker albums from 2009 to 2011. 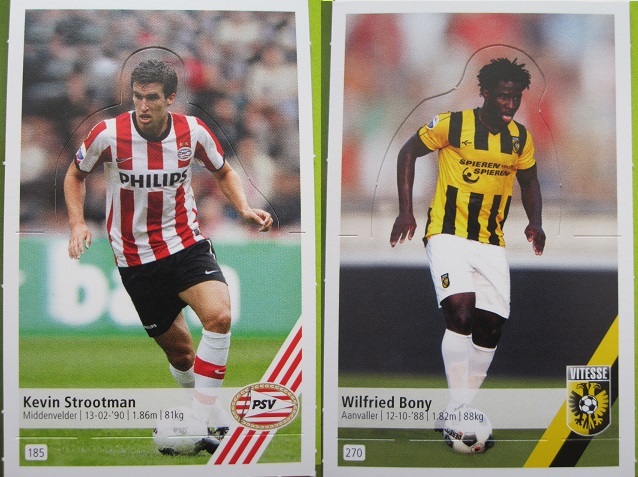 The company Plus decided to produce a collection of cards to be the official collection of the Eredivisie 2011/2012 (there is therefore no more sticker collection of the Eredivisie since the AH album of 2010/2011). This is actually an innovative product, as the cards of the players can "pop-up" and become 3D, the upper part of the player can be lifted and the back of the card is put backwords like in the picture below. The collection has a large binder and the cards are inserted in plastic folders. Between each plastic folder and the other there is a paper page with details and facts about the teams. The album opens with the table of contents, then the teams are showed in alphabetical order. Each team has a paper page with details (drawings, facts, etc...) and a plastic folder to contain a total of 16 cards: the club badge, the coach (pop-up card), and 14 pop-up players. The collection includes thus a total of 288 cards. At the end of the binder there is a checklist (2 pages) with pictures of all the 288 cards and a special cardboard where it is possible to place the desired pop-up cards in 3D to compose a personal team. Among the young prospect of the season 2011/2012 included in this collection we can mention some players that later on left the Eredivisie for a bigger competition: Christian Eriksen (from Ajax to Tottenham), Stefan de Vrij (from Feyenoord to Lazio), and Marco van Ginkel (from Vitesse to Chelsea). In this collection we find also Kevin Strootman, who moved from PSV to Roma, and Wilfried Bony (from Vitesse to Swansea and now Manchester City).